Here is another editing software site to check out. It is called Aviary. What is different about this than other programs we used? Junior High students created edible color wheels in art class. Today we will be exploring DoInk. Sign up and see what the program can do. We will be writing a review next week so do a good job exploring the program. ReadWriteThink.org has an interactive trading card lesson where the student creates a trading card from a story he/she has read. Students identify character traits, story setting, and other reading skills and when finished they can print out their own trading card. Today we are going to add some audio to our blog. I want you to record a reflection about what you have learned in one of your classes today. The audio should be at least 1 minute long. Click here to go to the Vocaroo site to record. After you paste the audio into your blog, write a quick review and include how you could use this in your classes. Remember, if you sign up the site will save your Vocaroo's! TypeWith.me and Twiddla are both online collaborative tools. You can use them to share information, the question is: Which tool is better? Evaluate both sites based on ease of use, features, and performance. Might it be possible both would be the right choice for slightly different uses? You will need to work with a partner or two (or more) to see what you can and cannot do with each site. Make sure you take a couple screen shots of what you are doing. I want this finished Wednesday and will take a grade Thursday. Coach Cooper is having his students do line dancing this month. Here is a video of 5th grade students dancing to the Cha Cha Slide Part 2 by DJ Casper. DJ Casper is also known as Mr. C! While watching the video on my class computer I had to quickly grab my camera to get some video of Jonathon sliding in his chair. Apparently you "can't stop the rock!" Here is the class dancing to "Cupid Shuffle" by Cupid. Having line dancing in physical education classes help the students with rhythm and coordination. It is also an excellent aerobic exercise! Coach also wants the students to know how to do a few of the more popular dances so the students won't feel self-conscious at their future dances. Pivot Stick Figure Animator is freeware I downloaded after seeing examples created by students. One great feature is you can add your own background and make interesting videos. There are a few things to consider if you want to post the video to your blog. First you have to save your movie as a .gif file. This is a moving picture file (not to be confused with a .mov file) You have the option in the save menu of the program. After I saved it as a .gif I uploaded it to the blog as a picture, but it was not animated. I did a Google search on "uploading gifs to blogger" and found this post from the blog Blogger Tips and Tricks. In it the author suggested using Photobucket to host the picture and using the html code to post the picture. As you can see above it worked! These are students that go to school in Doha, Qatar. As you can see above, Qatar is a country in the middle-east. The above panorama shows the Museum of Islamic Art. You may read a post about a field trip that went to the museum. Here is Shelby reading during our live stream. We had a great time reading the Dr. Seuss books all day! Tomorrow is Dr. Suess, Theodore Guisel's birthday. 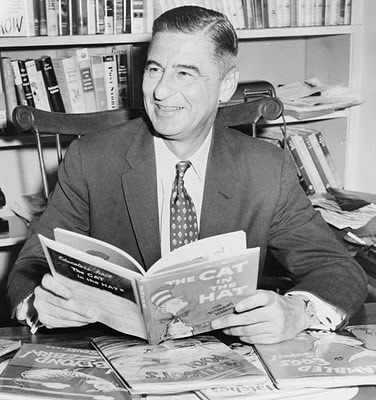 The National Education Society has named the day Read Across America day in his honor. Here is a link to the Seussville page about Read Across America. What will you do to celebrate reading tomorrow?